Christians say that the beginning of the end of the world started last year on September 23 when the constellation Virgo appeared in the skies. The significance of the Virgo constellation in September last year was that it appeared a month after the Solar Eclipse in the US – which was interpreted as being the “great sign” mentioned in Revelation 12:1 which also talks of a woman in the sky, IE Virgo. The passage reads: “A great sign appeared in heaven; a woman clothed with the sun with the moon under her feet and a crown of 12 stars on her head. Christian conspiracy theorists now believe that other ‘signs’ from the Bible are impending and one will see aliens come to Earth to do the work of Satan. Conspiracy site Unsealed said: “Unfortunately for this world those who are coming are not cute little friendly ecologists with solutions for our ills. “They’re more akin to the creatures in A Quiet Place” – where monsters invade Earth. The website points to signs from the Bible that reveal demons will possess Earth. 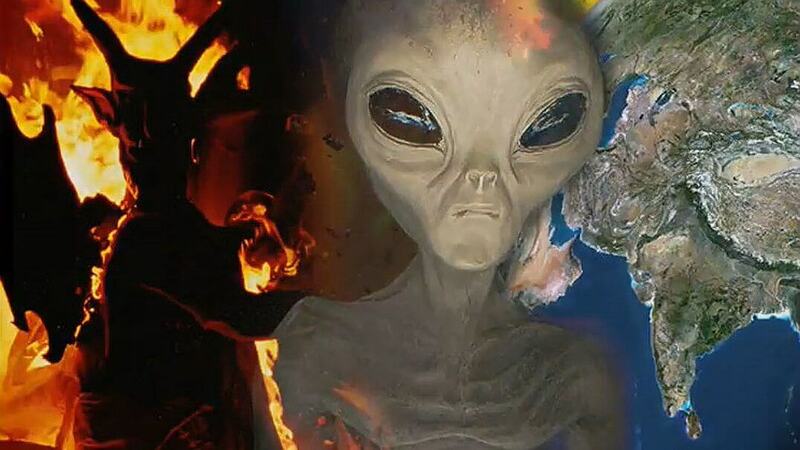 Accompanied is a picture of an alien, with the caption: “I’m not an alien from outer space. I am a demonic fallen angel. I am not extraterrestrial, I am interdimensional. The website adds: “These things have been written, so when they happen, we will know that they are from God. “Only He could know thousands of years in advance what would happen.